The Compass has muscular looks and looks intimidating despite being not so big. It was also priced well, hence fitted the bill perfectly. The Jeep Compass 2019 will come next year. This will also be a locally manufactured SUV and will be exported to other car markets. The design and the powertrain will remain the same. However, a new automatic transmission for diesel will be introduced along with an advanced 4WD system. This will be the Jeep Compass TrailHawk and it ill be launched next year.View offers on Jeep Cars from Jeep dealers in Hyderabad at Autozhop. The front grille, bumper, creases on the bonnet and the placement of the insignia, all are almost identical to the bigger Jeep. This combined with the 1818mm width makes the Compass look muscular. The headlamps are powerful bi-xenon HID units underlined by an LED strip. But the twist is that these are not the DRLs (daytime running lamps). The actual DRLs are located above the fog lamps, next to the indicators. And since they’re not using LEDs, they have a yellow tinge, which is a bit of a letdown. Even from the side, the Compass carries a proper SUV stance, with squared off wheel arches as well as a rising window line with a sharp kink towards the end which makes for a wide shark fin C-pillar. The Limited variant also gets smart looking 17-inch alloy wheels. The body line which goes through the door handles, the slight depression towards the lower half, and the Compass badge on the front door add a bit of drama to the design. The 4395mm length and 1640mm height make for perfect compact SUV proportions. The Compass looks stylish from the back as well. The LED taillamps carry the same kind of underlines as the headlamps, and the cluster even splits into the tailgate. The dual-tone roof has a chrome outline belt, which dips down with the rear windshield and looks pretty neat. That is all the chrome the rear of the car gets and and we think it’s just the right amount. Overall, the Compass looks very solidly put together. All the panels feel heavy and there is a sense of assurance that the Compass can take a few hits without skipping a beat. The design itself isn’t much of an attention grabber, but its stance and the fact that this is a Jeep is enough to make heads turn. Given how well finished and upmarket the front seats look, you half expect them to come with power adjust. They don’t. Still, it’s easy to find a comfy driving position, the large seats are well cushioned and supportive, and what you also get is a fairly good view of the world outside. However, the thick A-pillar can be obtrusive at crossroads. Sitting pretty in the driver’s field of vision are the Compass’ stylish hooded instruments. The data-rich multi-information display shows everything from odo, trip and fuel economy readings to oil temperature, coolant temperature and battery voltage. What is an eyesore, though, are the blanked-out buttons on the steering wheel. On export versions, the buttons operate cruise control, a feature that’s frustratingly been left out for India. Another irritant is the position of the driver’s audio controls on the back of the steering spokes. The buttons are not only hidden from view, but are also small and fiddly, and easy to press inadvertently. All other controls fall easy to hand and even the 7.0-inch touchscreen, that does look lost amidst its gloss black plastic surround, is within easy reach. What is also a nice inclusion is the electronic parking brake that is standard across the Compass range. A same 2.0-litre Multijet engine will power the Jeep Compass 2019. This engine will churn about 170bhp of power and 358Nm of maximum torque. There will be a six-speed manual and a new nine-speed dual clutch automatic will be made available. The TrailHawk will also get a 4×4 with low range capability. Jeep Compass 2019 The petrol engine will be the same 1.4-litre MultiAir unit. This will churn about 160bhp of power and 250Nm of peak torque. It will come with a six-speed manual and seven-speed automatic (dual-clutch) transmission. Both these engines are being manufactured in India and hence the price of the Compass 2019 will be competitive. Both engines are powerful and smooth in running. 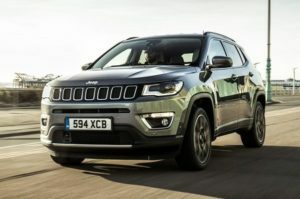 The Jeep Compass 2019 will be continue to be exported from India and so will the TrailHawk variant also. The Compass is doing well for the company and hardly has any direct competition currently.The new Jeep Compass 2019 will return about 13km/l in the city for the diesel and close to 17km/l on the highway. The petrol will have a mileage of 9km/l for the manual and automatic in city and close to 13km/l on the highway. Petrol-automatic SUVs aren’t known for shining fuel economy figures. Judged in that light, the Compass petrol automatic’s 8.5kpl city economy and 12.5kpl highway economy figures are more than just acceptable. For reference, the comparable Tucson delivers 7kpl and 11.8kpl in the town and on the highway, respectively. The 4×4 diesel Compass proved quite efficient too with fuel economy figures of 11kpl in town and 14.2kpl out cruising on the highway. We would like to point out that we conducted our fuel economy tests with the Compass’ AWD system set to Auto. The weather was fine on the days of our fuel test but inclement weather, which would have had the driveline reconnect for added traction, could have marginally impacted economy. The Compass looks like a proper SUV, and rides like one too. Over bumps, the suspension feels soft and absorbs undulations very well. Especially over speed breakers, the Compass just glides, with the suspension settling down instantaneously. This softness in the suspension made us believe that the Compass would exhibit lots of bodyroll in corners, but we were wrong! Chuck the Compass into a corner and it maintains its lines properly. There is only slight body roll and the suspension suddenly feels stiff enough to the point where you could even call it sporty! This is because this SUV gets Frequency Selective Damping, which means that the suspension can mechanically differentiate between bumps and body roll and alter damping accordingly.Book a test drive for Jeep Compass in Tryaldrive. But this has a flipside too. While going over small undulations like rocks or broken roads the Compass’s suspension remains stiff and hence you can feel some side to side movement in the cabin. But at the same time, if you go over the same undulation a bit faster, the damping increases and the car just glides over such patches. This nature keeps you guessing whether you are going to feel a bump or not. The perfect balance between a cushy ride and sporty handling is really hard to achieve, but for the most part, the Compass manages it really well. Given that the Compass gets an electrically assisted steering, it does suffer in terms of feedback. While turning, the feel from the wheels is not well translated and keeps you guessing what the tyres are up to, partially because of the four-wheel drive system. But it does weigh up at high speeds, which helps give an assurance of control on the highway.